Two house systems that affect moisture control in houses are air/vapor barriers and ventilation. Air is a good insulator, so materials with a lot of air voids make good insulators. A “thermal bridge” is where insulation is not continuous, allowing heat to leak out. Wood wall studs form thermal bridges, for example. The most common source of complaints against home inspectors in many areas is wet basements. Stairs, guards and railings often have issues that make them unsafe. Attic air/vapor barriers should always be on the warm side of the insulation. In the Insulation & Interiors Course, you will learn to inspect thermal insulation, vapor barrier and ventilation systems. You will also learn how to inspect interior elements of homes such as walls, ceilings, floors, basements, doors, windows, interior stairs/railings, countertops and cabinets, and garage doors/door operators. Study Sessions are included to help you make your way through the material. Quick Quizzes will help you check your progress. Several Field Exercises will help turn your knowledge into real-world experience. 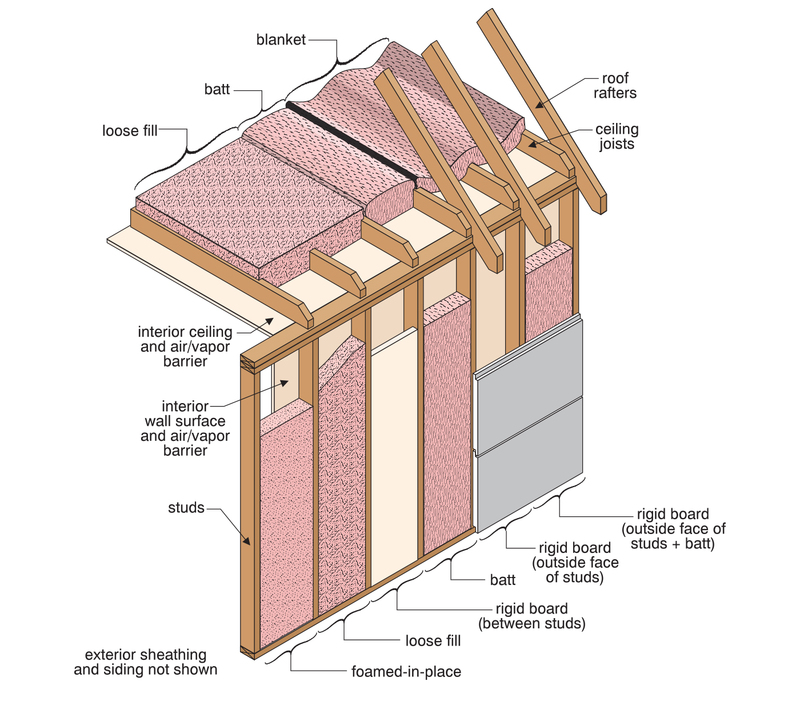 Forms of insulation — This illustration shows the common forms and how they are typically used. It is from our Insulation and Interiors Course. All of our 10 Courses contain easy-to-understand illustrations.